If we’ve heard “but that’s not fair!” once, we’ve heard it a thousand times. But let’s stop a second and really think about this complaint. Is it legitimate? We all know that life’s not fair, but should it be? Should we be? I really find this concept of fairness fascinating. Mainly because everyone (our students, our kids, even us) tend to think that fairness is really important. But, in reality, we don’t want things to be fair. And if we want to be the best teachers and parents, we shouldn’t always be fair either. Let’s look at a few reasons why…..
We don’t want life to be fair. Both we and our students tend to look at those around us and to think that if life were fair we would have what they have. But that’s not true. If life were fair, we would have way less than we do. While I realize that this blog has a global audience, most of the readers live in America or in a first-world country. Which means you are richer than the majority of the world. If life were fair, you would not have more. We would have much, much less. And wealth isn’t the only example. Think of the other blessings in your life that others around you don’t have. It’s not fair that you have them, but aren’t you so glad you do? We often look at fairness all wrong. We need to do what’s best for that child or teen. While consistency is important, what’s ultimately the most important is to do what’s best for the student or child. And sometimes that means breaking from our normal discipline plan. Yet, I know that sometimes teachers and parents feel like they are stuck because they want to be fair. Why are we so loyal to fairness? We really need to rethink this. God’s not fair, life’s not fair, and we’re all glad of that. So we don’t need to be fair if it’s in the best interest of the kids for us not to be. Fairness is a poor reason to withhold something good. How often have I heard a parent or a teacher say, “Well, because I can’t do it for everyone, I can’t do it for you.” I know this is conventional wisdom, but I’m really not so sure it’s a good idea. In fact, I’m pretty sure it’s unbiblical. God gives each of us individual blessings that He doesn’t give everyone else. And, furthermore, He tells us to rejoice with others when God gives a blessing to them that He didn’t give us. Wouldn’t it be better if we modeled God’s behavior and taught our children and students how to rejoice with others? Wouldn’t it be better if we could give a special gift to one sibling today just because we saw something that we knew they’d love, knowing that at some point we’ll do the same thing for our other children – but without having to keep score? 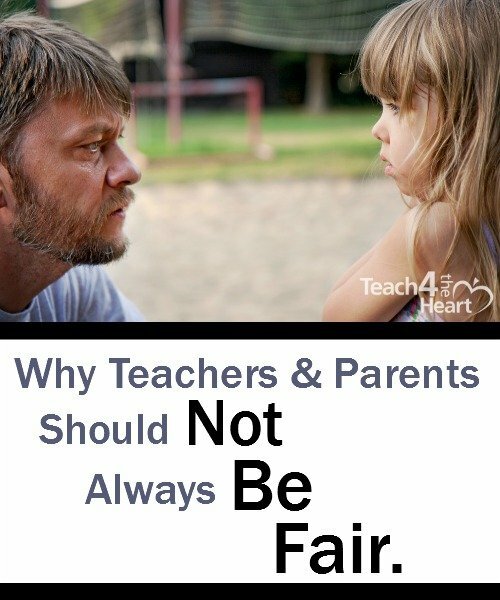 Our students and kids need to learn the correct view of fairness. The sooner our students really start to understand this issue of fairness, the better. The bottom line is that we don’t deserve nearly so much as we like to think that we do. And that, in reality, if things were fair, our lives would be a whole lot harder. So when we see something that’s not fair, we need to be happy for the person who has receive the grace or the blessing, instead of getting jealous. Do we really wish that they hadn’t received something good just because we didn’t? How selfish and silly is that? The more we can learn to think this way ourselves – and the more we can help the kids shift their thinking – the happier we will all be. It’s impossible anyhow. And, finally, let’s be realistic. If we put every ounce of energy into being fair, could we make everything fair 100% of the time? No. It’s simply impossible. Maybe that’s because life’s just not fair. What do you think? Do you feel obligated to be fair all the time or do you agree that fairness is overrated? Share your thoughts with a comment below. If God’s Not Fair, Should We Be? I completely agree. I have two children, and they are five years apart in age. There were many times that I had to remind them that I love them both just as much, but I cannot treat them the same, because they are not the same. I think as a culture we have taken the concepts of fairness and “sameness” to an unhealthy level. “Fair” is a misunderstood concept. It does not mean everybody gets the same thing. It means that everybody gets what they need. This is what makes God fair. He gives us all what we need. So technically we should all be “fair”, just not the way most of the world views “fair”. Don’t confuse the word ‘fair’ with the word ‘equal’. I cannot treat my children equally because the are not the same, they have different needs, personalities and abilities. However I always treat my children fairly, they get what they need…and that is what we all deserve….to get what we need….not what is equal to someone else.